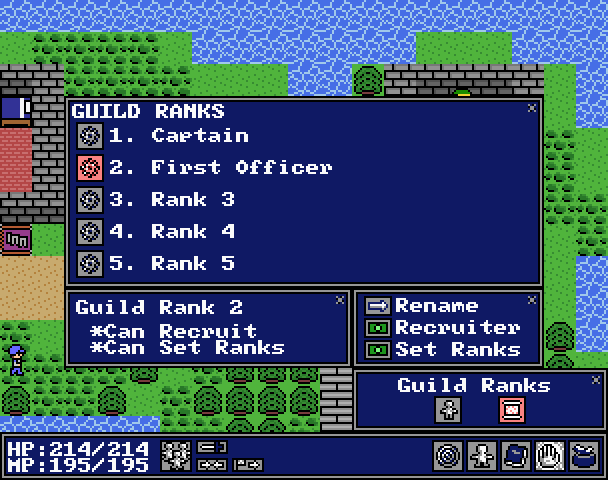 Soldiers are one of NEStalgia’s most popular classes, but the problem with Soldiers has always been the way they use their abilities. Because Soldier special moves haven’t had anything like an MP cost in the past, other design measures had to be taken to balance them out: Impale could miss, Headbutt would constantly fail and cause blow back damage, Reckless was a crapshoot, etc. 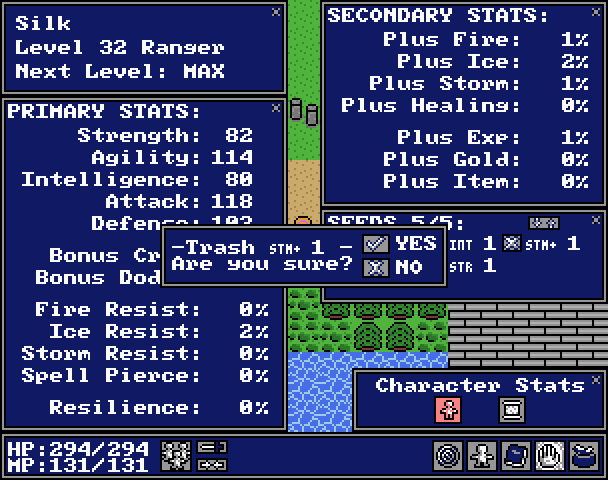 When redesigning Soldiers I wanted to keep a bit of the random chance and blow back damage aspects of their abilities without making those penalties quite so harsh. In order to do that while still keeping things balanced, Soldiers needed a new way to power their abilities. 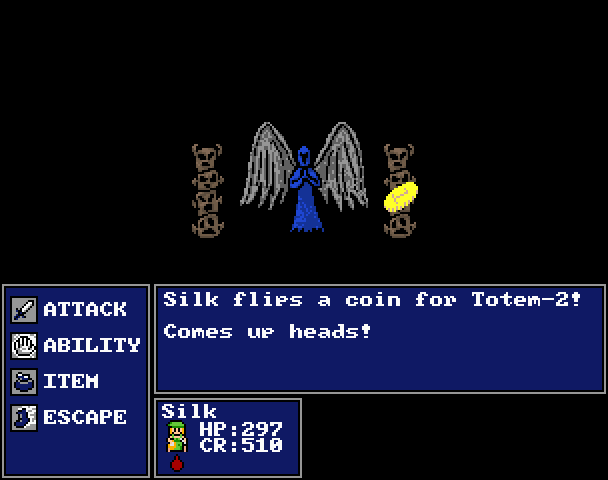 My answer to the problem was the use of a very common modern RPG mechanic: a stamina meter. Reckless – Pretty much the only thing that’s remained the same about this special move is the name. At 4 Will points, it now targets all enemies and does a full damage strike on each target, but also returns 50% of the damage back to the Soldier. 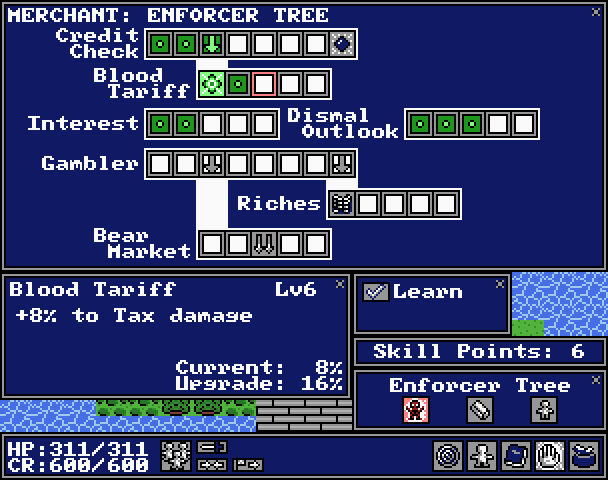 With some investments in the skill tree, that damage can be reduced to 20%. Impale, Gore, Headbutt – All of these abilities can be upgraded to have either a 100% Bleed success rate, or very close to it. 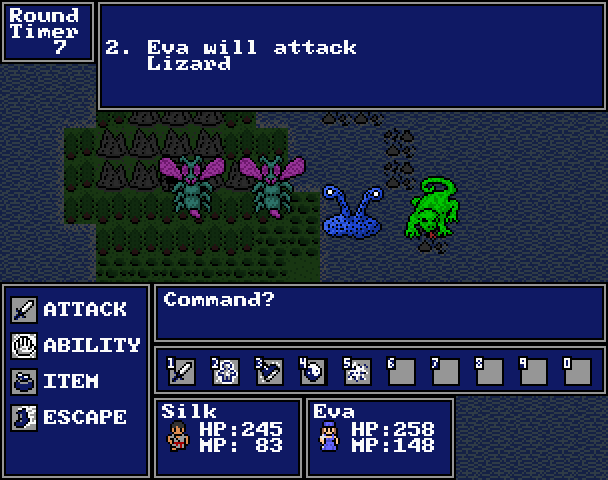 Hopefully this will be one of the last few blog posts that I write about v1.52 before all of you actually get to play it. 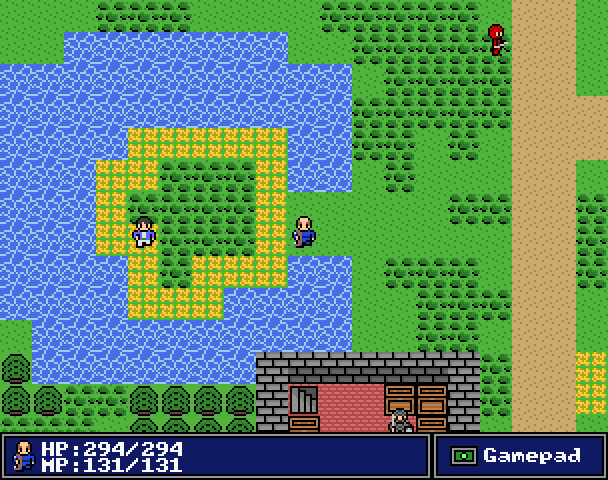 Development is moving along well, albeit slower than I expected (I still don’t want to give out a hard release date). There is a lot of new stuff in store for the coming weeks, so stay tuned. Will the new spell animations be included in v1.52? What changes are coming to Soldiers and Merchants? Are Stat Seeds staying the same? 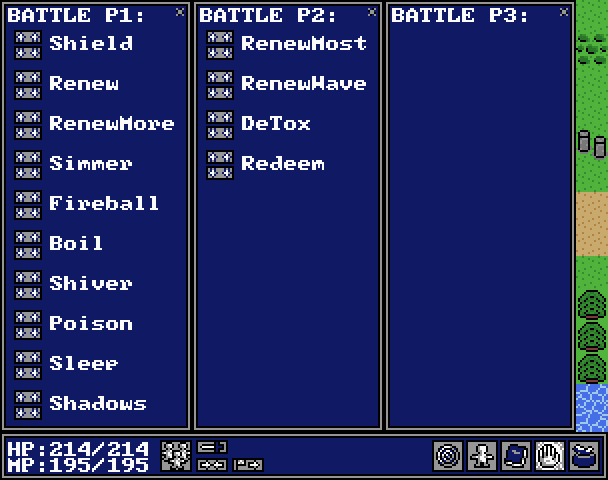 Stat Seeds will still function the same way, with one major convenience change: you will now be able to remove individual seeds through your Status Menu instead of having to purchase and use a Seed Cleaner to remove all of them at the same time (removing a seed will still trash it). This change should make managing and swapping out your seeds much easier. What does the big re-balancing entail? 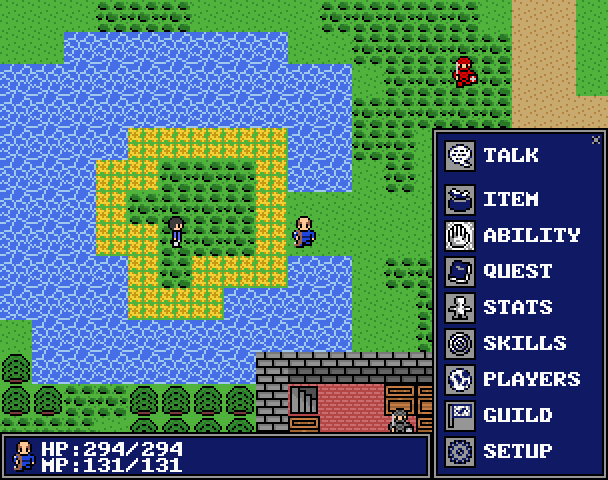 As we’ve mentioned many times in the past few months, most of the game is going to be re-balanced to accommodate the new skill trees and to smooth out the rough edges that currently exist. 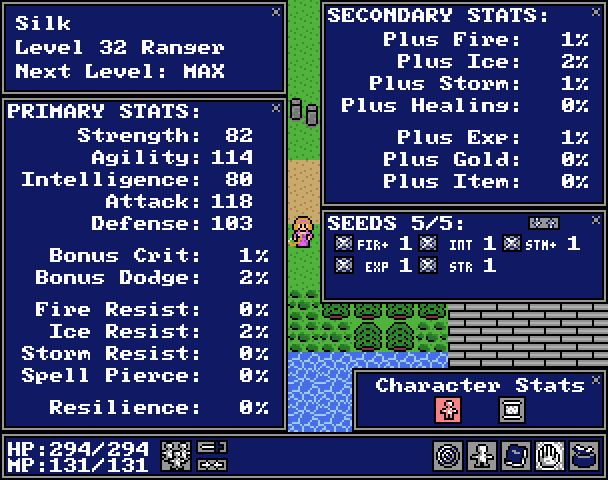 The stats on many abilities, items, monsters, etc. may change, but the general “feel” of the balance throughout the existing content should remain the same. Inflated burst damage is the biggest balance issue right now. 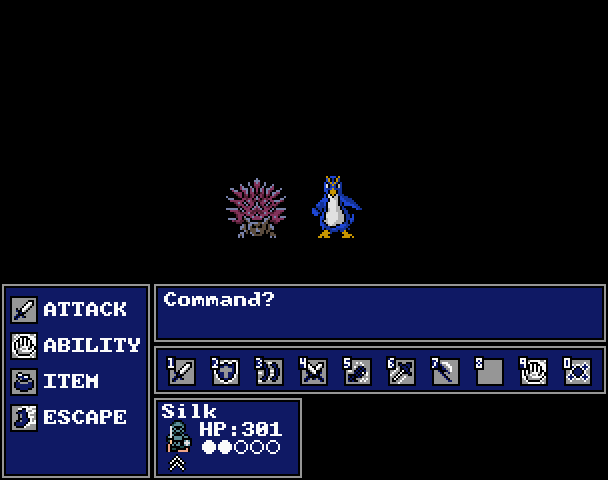 Across the board you’ll be seeing attacks doing a bit less damage, particularly AoE (group) attacks. Damage done by AoE abilities like Wizards’ Blizzard spell will now be spread out across multiple targets. 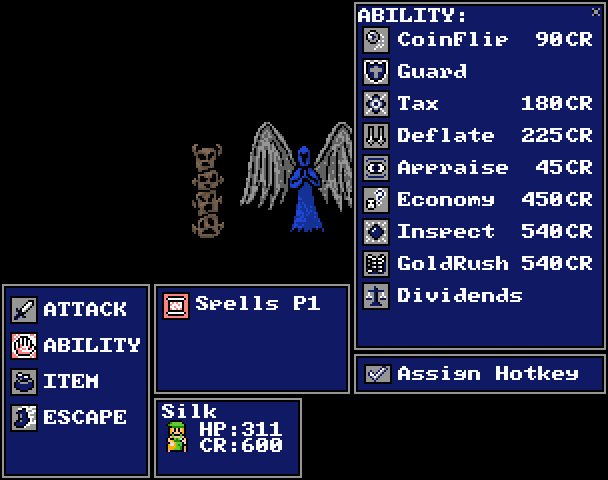 The more targets your attack hits, the less damage it will do to each individual target. This should help close the gap that currently exists between classes that have AoE attacks and those that don’t. Although we’ll be testing all of this it may still take a couple weeks of tweaking on the live servers to get things just right, but balance will be a top priority for us with this update and the small patches that follow. 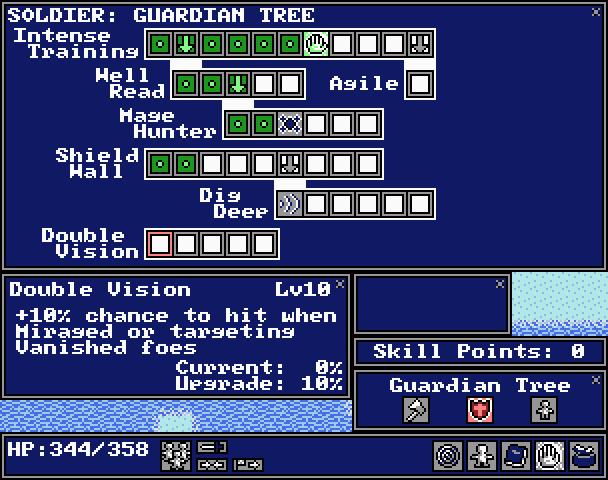 Located within the Foundation Tree shared by all classes, the new Elemental Enchant skill branches will serve to make Plus Element, Piercing and Elemental Resist much more viable for melee classes. 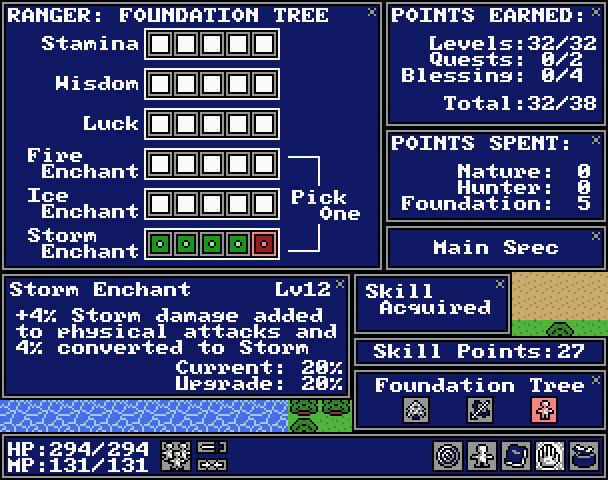 Each level of the enchants add 4% elemental damage to all physical attacks (that includes special moves), and also convert an additional 4% of the base damage to elemental. Therefore, if you max out an enchant branch you’ll be dealing and additional 20% elemental damage on physical attacks, and another 20% of the base damage will be counted as elemental. It may sound confusing, but it’s actually pretty simple. If you’d normally do 100 damage to an enemy, then with a maxed out Storm Enchant you’d deal 120 damage, with 40 of that damage being counted as Storm. That means that any Plus Storm you have will increase those 40 points of damage, and any Storm Resist the enemy has will reduce them (Spell Piercing comes into play as well). In other words, these new enchants are a double-edged sword, but one that gives players another potential play style and also increases the value of many of the overlooked gear drops in the game. The next time you pick up a piece of Soldier gear with a bunch of Plus Fire on it, you might want to hold on to it. When will v1.52 be released? The size and scope of this update has grown exponentially in the past few weeks, which is partially why it’s taking longer than I anticipated. Almost all of the new features would be big updates on their own, and combining all of them into one massive patch is much more time consuming than the “skill trees only” update that I had originally planned. 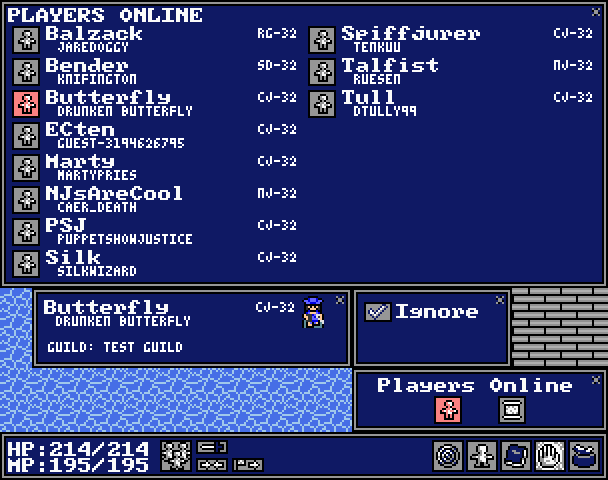 When we’re nearly finished testing and I can set a solid release date, all of you will be the first to know about it! For the past few months I’ve been intentionally vague about Skill Tree specifics. The information filter is partially due to the fact that with an update as big as this many of the specifics don’t get worked out until it’s actually close to completion, but also because some players tend to take tidbits of information about sweeping changes and freak out unless they have the whole picture. Today I’d like to show you the whole picture. Or most of it. This is part one of a two part blog series that should give you a much better idea of what to expect from the forthcoming v1.52 update. The best way to present all of this information is in Q&A form, and if you have additional questions after reading this post then feel free to ask them in the comments section. What are NEStalgia skill trees? 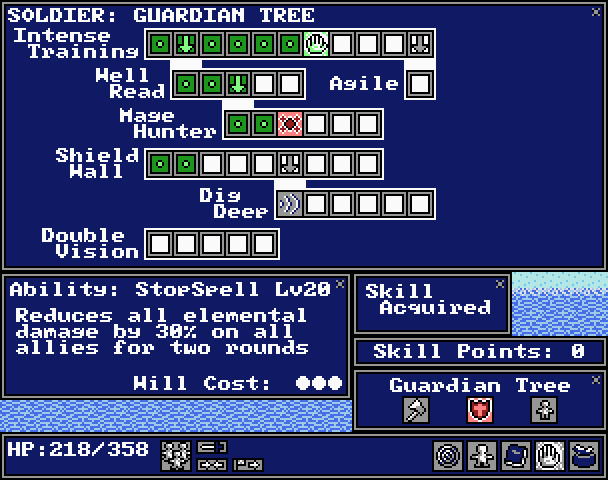 Skill Trees are just NEStalgia’s take on the way that most modern MMOs and RPGs handle character talent customization. The best way to sum up our approach is to skill trees is to think of the system as the 8-bit child of Mass Effect (or KOTOR) and Diablo 2. Progression through the skill trees is very simple and easy to understand, yet offers each class a wide variety of new customization options. 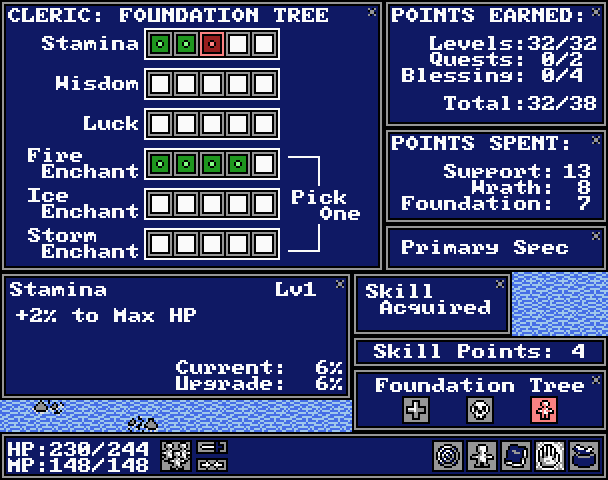 All of you are familiar with NEStalgia’s current talent system: Moon Blessings and Milestone Boosts. The new skill trees will simply take the amount of customization to the next level, and add a heck of a lot more variety to the classes and the gameplay itself. 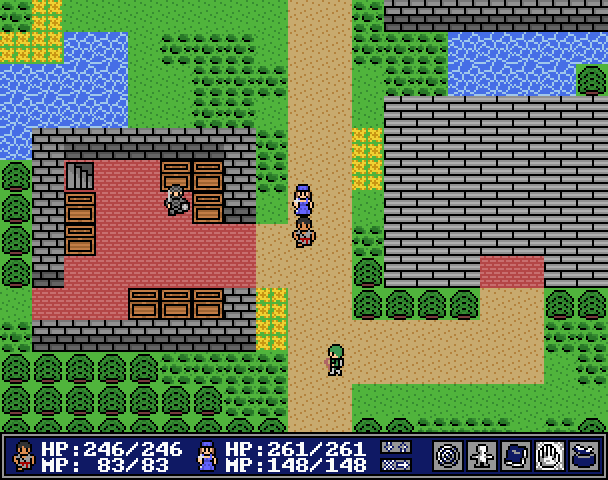 As time has progressed, we’ve come to realize that the greater a player’s ability to customize their character, the more enjoyable and re-playable the game is. There is a tipping point, however, and many games cross the line into being overly complex and too intimidating for first time players. If you haven’t noticed by now, I have an almost Steve Jobs-like obsession with keeping things simple… but I’m always open to adding new layers of complexity when necessary. 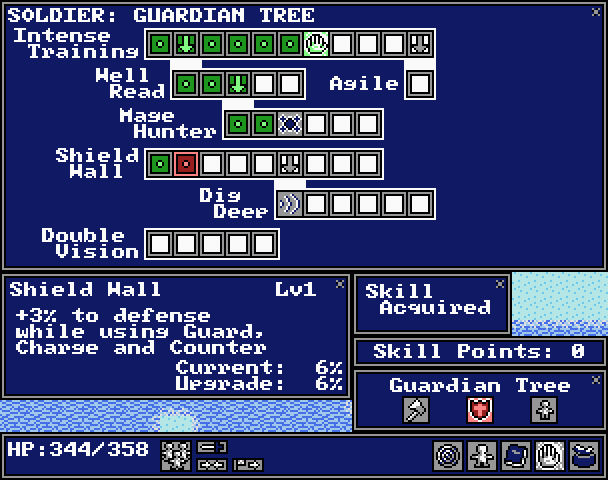 My objective with the skill tree system was to make it easy to use while simultaneously giving it a lot of depth… and I feel that I’ve accomplished that. 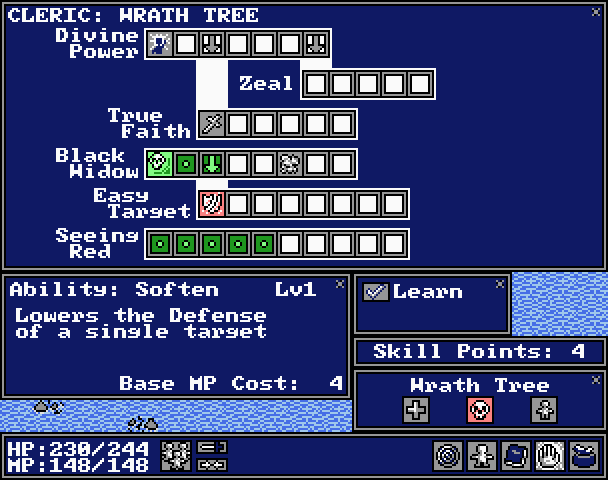 The answer to the question “Do skill trees make sense in an 8-bit inspired game” is a resounding yes. 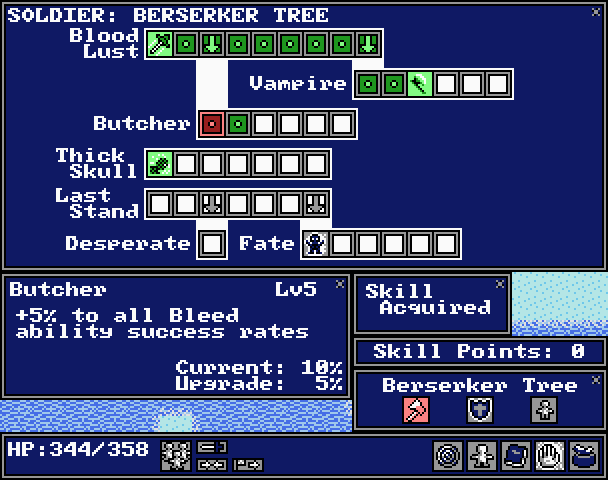 How do skill trees work? 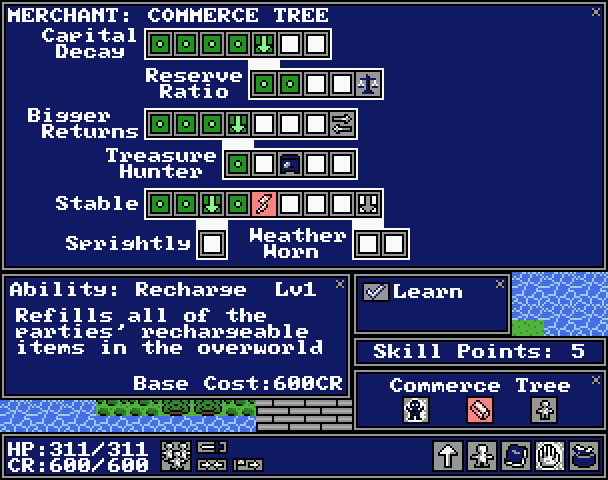 Players earn Skill Points by leveling up, which are then spent to purchase individual skills within their Skill Tree HUD. 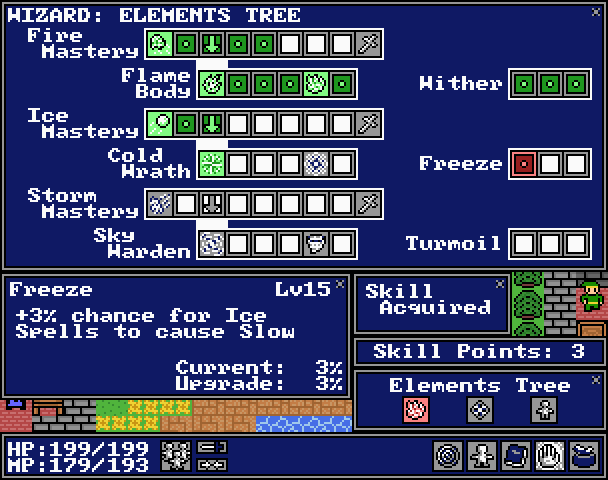 Each classes’ skill tree set is spread out across three pages. 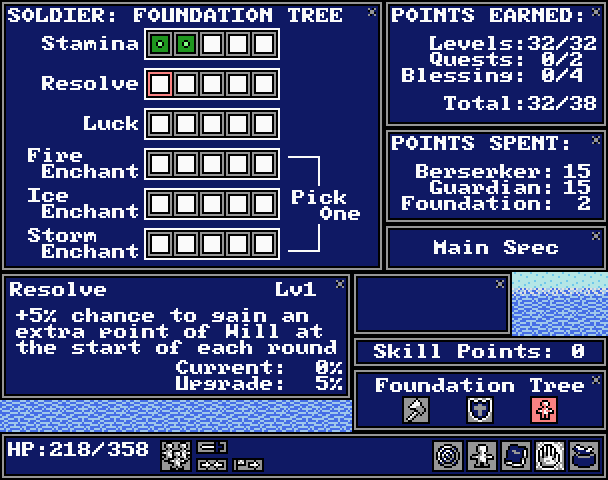 The Foundation Tree is basically the same for each class, but the first two pages vary wildly between classes. 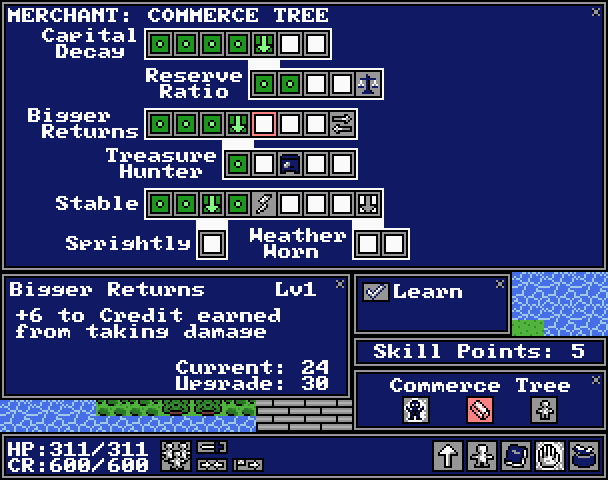 You progress through the trees by investing points from left to right. The down arrows allow you to move a step lower and begin spending points in connected branches, although certain branches also have a minimum level requirement. In addition to passive bonus skills and stats, you can also learn new abilities (spells and special moves) in the skill trees. 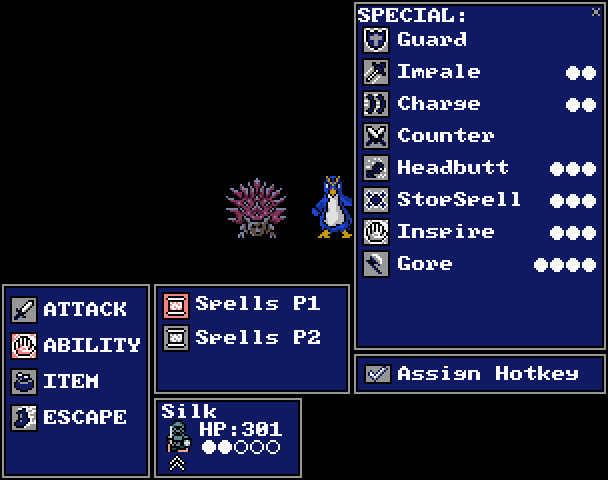 It’s important to note that each class still learns a limited set of abilities automatically as they level up. 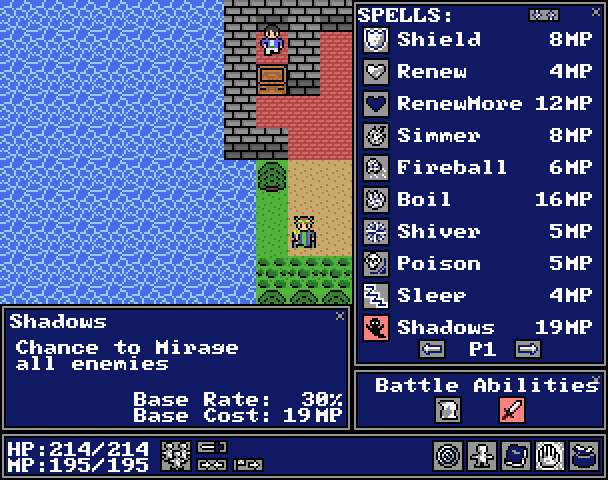 Clerics will always learn basic healing spells, and classes like Soldiers will always learn special moves such as Guard. 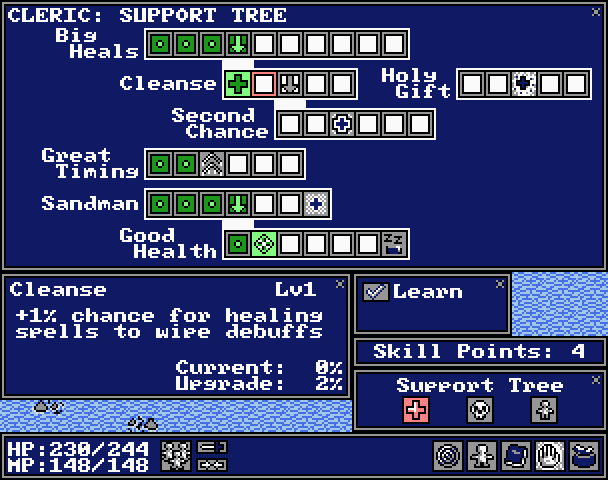 Can I reset my skill trees? Yes, and you don’t have to be a subscriber either. There is a new Master at Arms NPC in both Balzackia and Ardan who will reset your skill trees and refund all of your skill points anytime… for a 40,000 gold fee. This also comes packaged with a new subscribers only feature: the Master at Arms can store a second skill tree set, or Dual Spec for subscribers which can be accessed anytime. 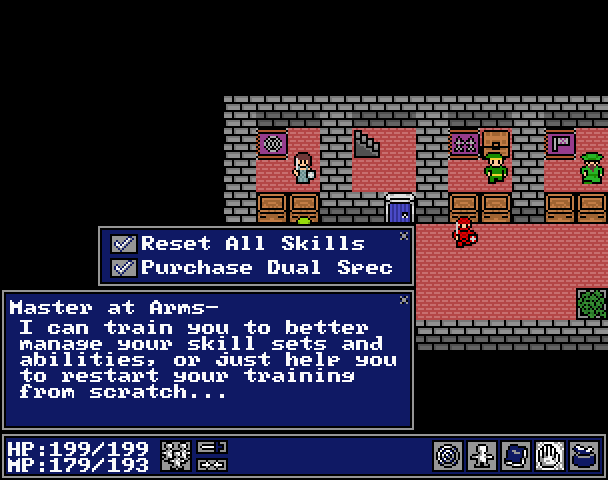 This means that you can fully invest your skill points two entirely different ways and swap between your specs with a quick visit to the Master at Arms. So what about Sacred Scrolls of Invocation/Revision? 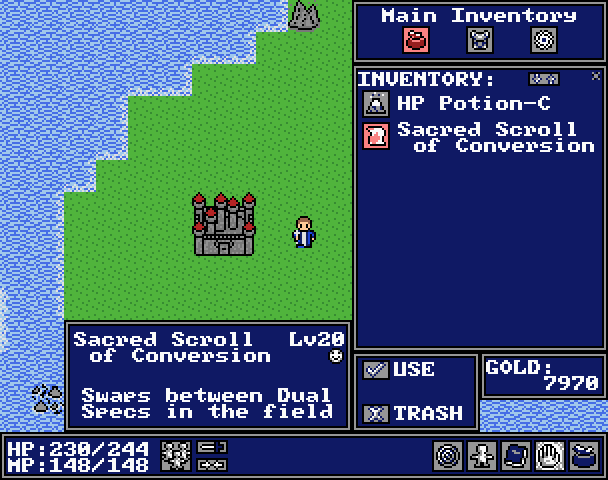 All existing Scrolls of Invocation and Revision obtained from Metal Slimes will automatically be converted into Sacred Scrolls of Conversion. 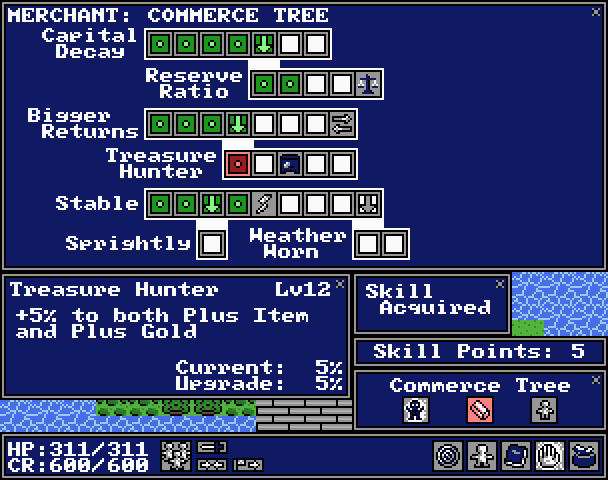 These level 20 items allow players to switch to their stored Dual Spec anywhere in the world, instead of just by talking to the Master at Arms. Metal Slimes will continue to drop this new type of scroll. What’s happening to Greater Moon Blessings? Moon Blessings as you know them are out. 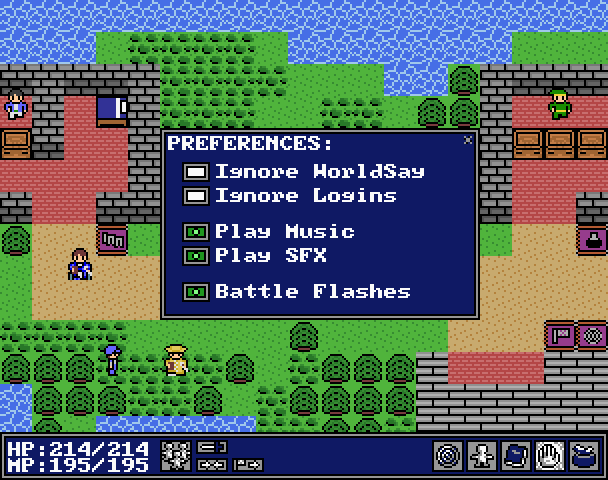 They are no longer selected during character creation, and they no longer bestow stat bonuses. 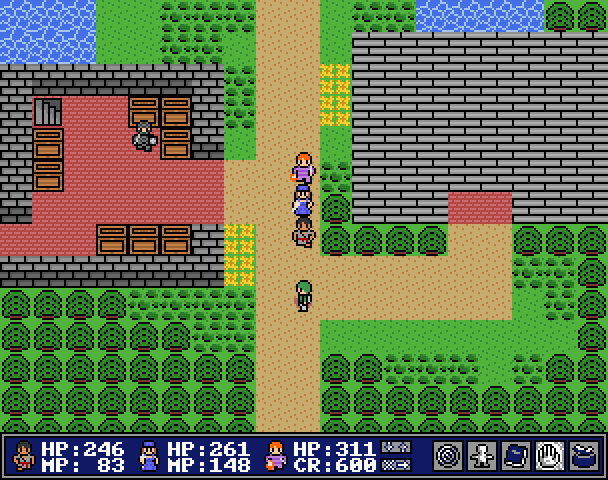 Instead, players can visit the existing Altar of the Moon to receive a one-time Moon Blessing, much like they do now with Greater Moon Blessings. A Moon Blessing still costs 100,000 gold, and now gives the player 4 additional skill points. Players who have already purchased Greater Moon Blessings will be credited as having purchase the new type of Moon Blessing. What does the big rebalancing entail? Will spell animations be included in v1.52? …So did this blog post provide you with the answers you’ve been craving, or did I pull a LOST on you and just raise more questions? Let me know!